Make your child's first forays into science fun! 52 clever and easy experiments for things that will zip, zoom, and fly, and fizz, bubble, and burst. For children ages 4 to 8. Introduce future engineers, inventors, naturalists, and artists to the physics and chemistry, biology and ecology behind everyday play. Create chemical reactions, explore gravity and friction, transform states of matter, play with air pressure, and much more through 52 simple experiments that zip and zoom, fly and fizz, bubble and burst. 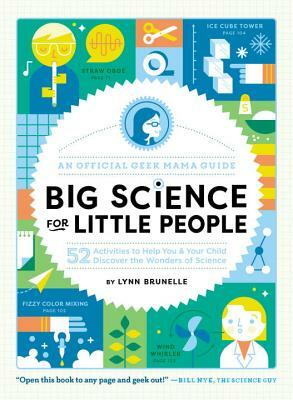 Geek mom Lynn Brunelle has created an interactive guide perfect for both kids and their parents: the projects will engage children, and the informative lessons will help parents when asked the inevitable question, why? 1. The Exploding Lunch Bag: Will you get out of the way before the vinegar and baking soda react with a fizzy burst? 2. Seed Hunt: Seek out whirly, sticky, and smooth seeds for a science-filled outdoor adventure! 3. The Marshmallow Launcher: Harness energy to fling sugary treats in the name of science. A four-time Emmy Award-winning writer for Bill Nye the Science Guy, Lynn Brunelle has over 25 years experience writing for people of all ages, across all manner of media. Previously a classroom science, English and art teacher for kids K-12, an editor, illustrator, and award-winning author of over 45 titles, (Pop Bottle Science, Camp Out! World Almanac Puzzler Decks, Mama’s Little Book of Tricks) Lynn has created, developed and written projects for Chronicle, Workman, National Geographic, Scholastic, Random House, Penguin, A&E, The Discovery Channel, Disney, ABC TV, NBC, NPR, The Annenburg Foundation, World Almanac, Cranium and PBS. A regular contributor to NBC’s New Day Northwest TV as a family science guru, Martha Stewart Radio as a family activity consultant and a contributor to NPR's Science Friday, she is the creator of the Mama Gone Geek blog and Tabletop Science—videos that make science fun and accessible. She has also written for several children’s and parenting magazines. She has won four Telly Awards and two CINE awards for her music videos which range in topics from bullying prevention, child protection and the adolescent brain for international curriculums through Committee for Children, to independent projects encouraging science literacy and STEAM. Her latest book, a memoir called Mama Gone Geek, was released in 2014 and won the Independent Publishing Award Gold Medal.